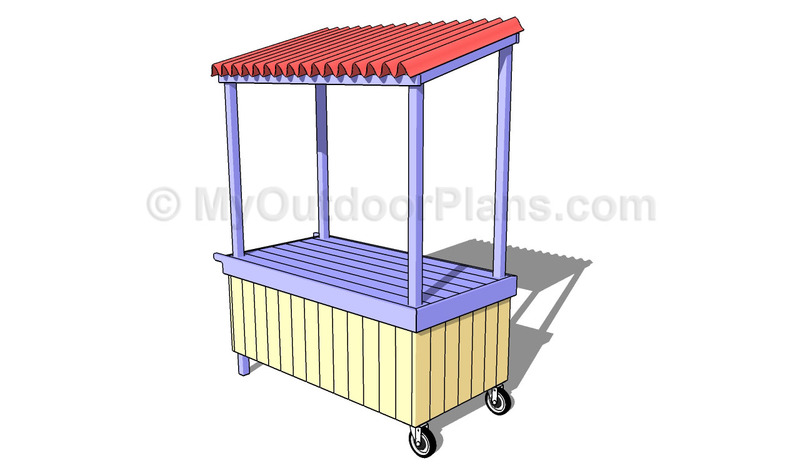 This step by step diy woodworking project is about outdoor storage box plans. 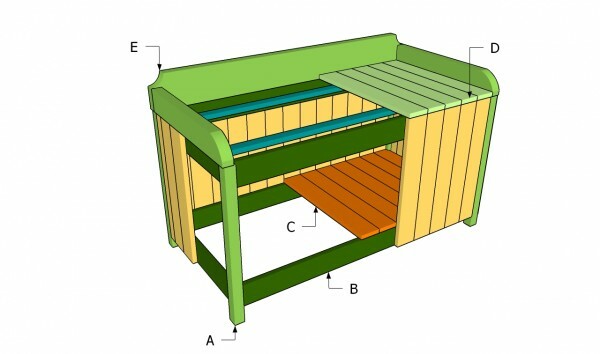 Building a storage bench for your backyard is easy, as you just have to follow proper instructions. First of all, we recommend you to take into account the alternatives and to choose the one that best fits your needs and tastes. Don’t forget that you could also adjust the size of the storage box, but still use the instructions as a reference. It is necessary to use weather-resistant lumber, especially if you want to place the box in your backyard. Pine, cedar or redwood are excellent choices, as they are durable and they will add character to your project with their exquisite look. From our experience, we strongly recommend you to use a pocket holes system, as to get rigid joints and to hide the head of the wood screws. 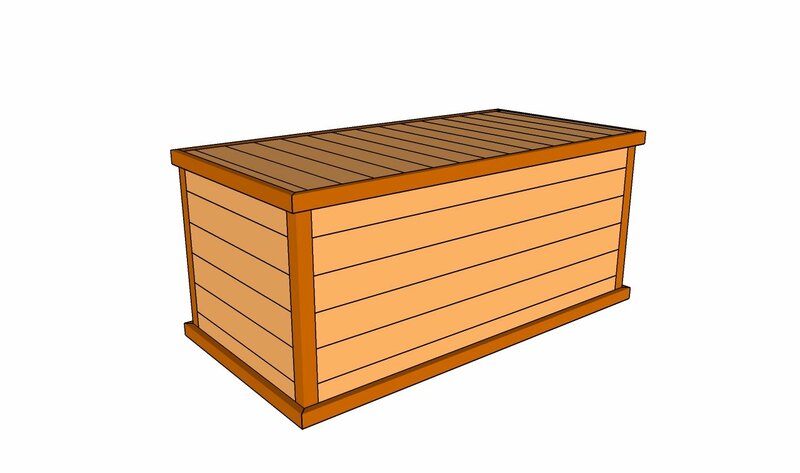 Top Tip: Building an outdoor storage box is a nice woodworking project, especially if you are looking for something that can be done in less than a day. Nevertheless, we strongly recommend you to use quality materials, such as cedar, pine or redwood. The first step of the project is to build he frame of the storage box. 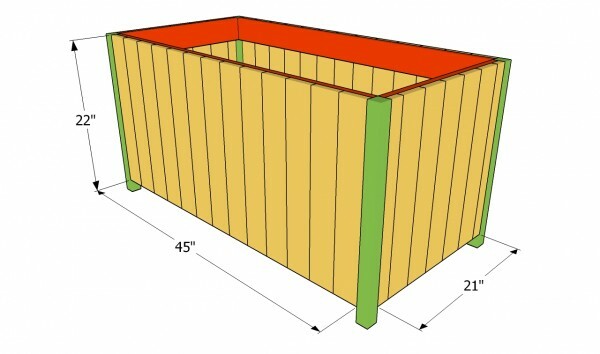 Therefore, we strongly recommend you to to use 2×2 lumber for the corner legs and 1×4 lumber for the aprons. In addition, use a pocket hole system in order to get strong joints and to hide the head of the screws. Drill pocket holes at both ends of the supports and lock them to the corner posts. Use a carpentry square to check if the corners are right-angled. 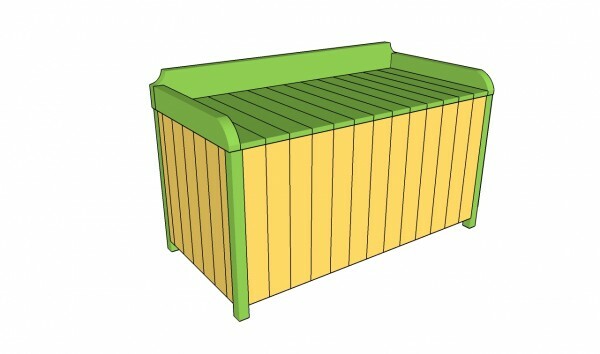 Continue the woodworking project by fitting the slats to the exterior of the storage box. 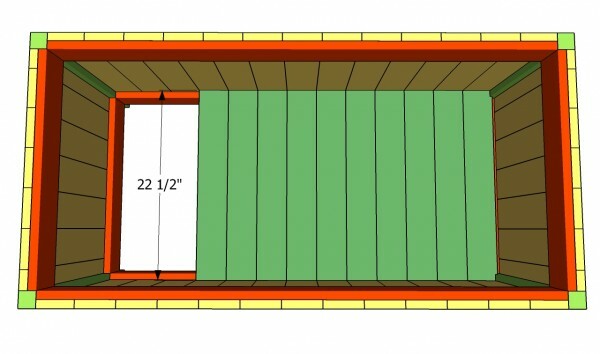 As you can see in the plans, you should start fitting the slats from the center. Drill pilot holes trough the 1×4 supports and insert 1 1/4″ galvanized screws from the inside. Use a circular saw to adjust the size of the slats, if they don’t fit into place. Work with great attention, making sure there are no gaps between the slats. Fitting the bottom of the storage box is the next step. 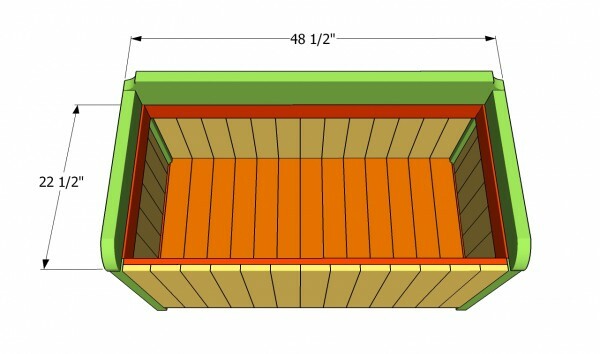 Therefore, we recommend you to attach 1×4 slats inside the box, as in the image. Fit the slats into place and drill pilot hols at both ends. Top Tip: Drive 1 1/4″ screws or finishing nails to secure the slats into place. Make sure you don’t leave any gaps between the slats, if you want to get a professional result. Add glue to enhance the rigidity of the structure. Continue the project by fitting the wooden trims. 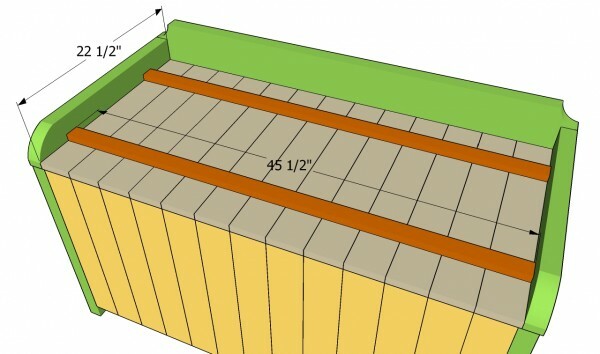 As you can see in the image, you should build the back trims from 2×6 lumber, making sure you cut the ends in a decorative manner. Top Tip: On the other hand, build the side trims from 2×4 lumber. Drill pocket holes into the trims and secure them to the frame with 1 1/4″ galvanized screws. Make sure the exterior edges of the trims are flush with the storage box. Building the top of the storage box is not complicated if the right plans and materials are used. 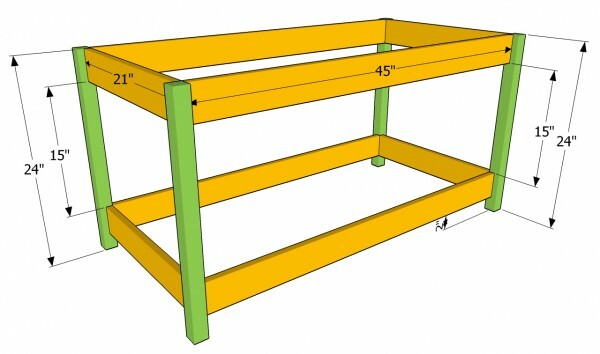 Therefore, assemble the lid on a level surface, by using 1×2 lumber for the supports and 1×4 slats for the top. Drill pilot holes trough the supports and insert 1 1/4″ screws into the slats. Fit the lid into place and secure it to the bottom support with metal hinges. Check if the lid opens properly. 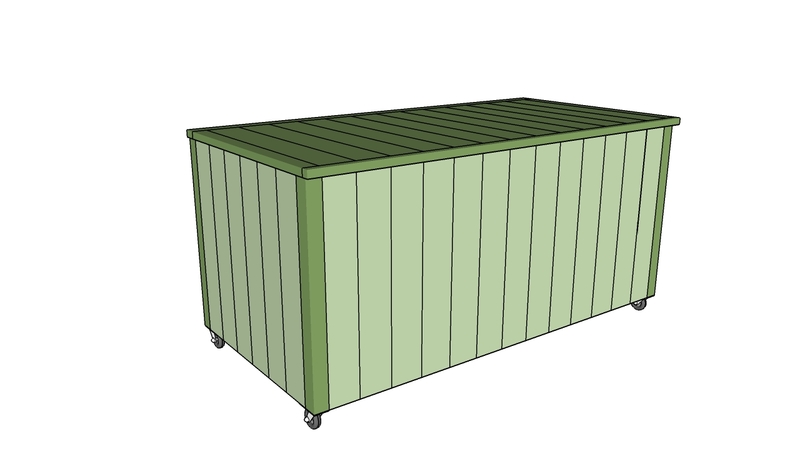 This project was about outdoor storage box plans. If you want to see more outdoor plans, we recommend you to check out the rest of the projects. Don’t forget to share our projects with your friends, by using the social media widgets.